If you ask me - the amusement parks in Denmark are kind of lame now that im 21 and have been in alost all of them a dozen times before. But in Spain i was finally visiting a amusement park i have never been in before and it was a lot bigger than all of those i have been in before! Port Aventura - just outside Barcelona - can be seen from afar because of their giant roller coasters. The tallest (Shambhala) is 249 feet (76 m) and i can say.. i was not happy about trying that thing. But my Roommate wanted to try it, so she got her way and i tried it... 3 times. My fear of heights was put to the test but in the end it was pretty fun. 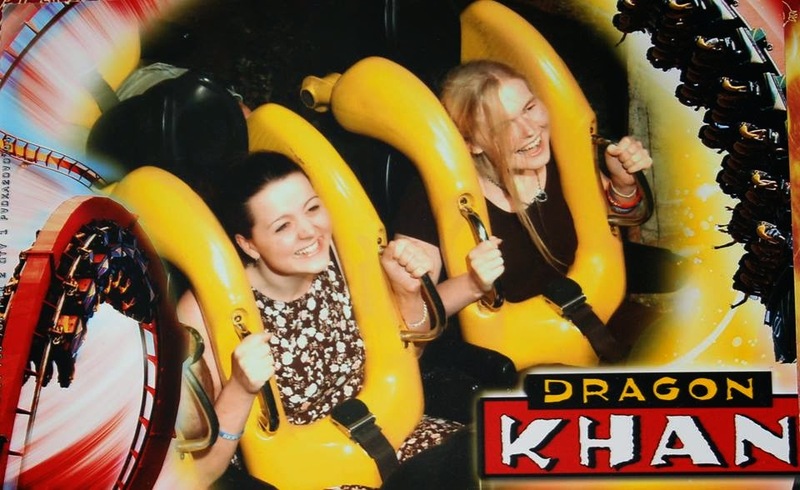 Another ride (Dragon Khan) was with 8 loops.. Again i was tested by my roommate. Not that i was not totally ok with it, but it was not fun in the beginning. I think we ended up in that one.. two times? Anyway we had an amazing day and the Park was decorated for Halloween and it looked awesome! White Shambhala and red Dragon Khan.